So, before the session, we spent a while perusing the mundane equipment lists from all of our DnD books (PHB1,PHB2,PHB3,AV1,AV2,MME) – and I built up a full manifest of possible equipment that might possibly be in the basement of the characters’ current base. 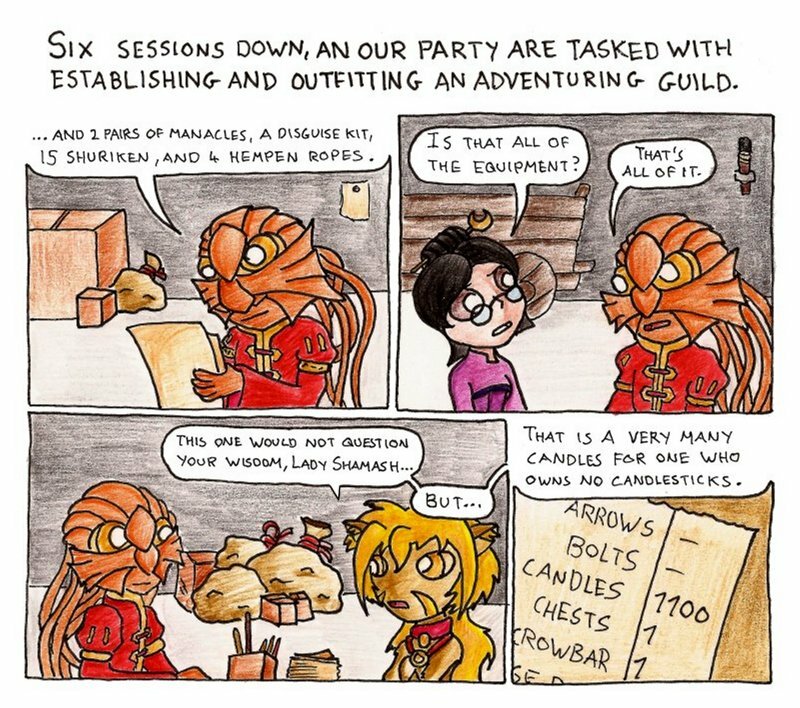 We then went through the list and worked out what the party would actually need to set up a new operation, totaled the gold, then gave the party a little extra gold than that, and a list of junk to spend it on. It turns out that only one item in any of the books costs 1cp, which is the candle. After spending 2989 of their 3000 gold, our plucky heroes had 11gp left over and nothing useful to spend it on, so we now have 1100 candles in a sack. I’m sure they’ll come in useful. Still not quite as awesome as the Arms & Equipment Guide from 3.5, which includes rules for exotic mounts like gelatinous cubes and island sized turtles, and snazzy artifacts like the Regalia of Neutrality. I think I know a wemic who can give you a good deal. You can eat mediaeval candles.